Hanife Schulte is a doctoral candidate in Theatre and Performance Studies at Tufts University. Prior to Tufts, she received M.A. degrees in Theatre from Ankara University and Emerson College. She explores how theatre as performance responds to cultural, political, and social issues. 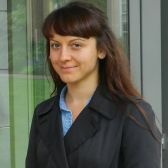 She received the Performing Arts Graduate Award in recognition of her Master's thesis entitled “Brecht in Contemporary German Theatre: Frank Castorf’s Productions of Brecht’s Plays from the Perspective of Postdramatic Theatre” at Emerson College in 2016 and was the recipient of a DAAD German Studies Research Grant. Our DAAD network is a vast and global net of connections between DAAD and its award winners, ambassadors, alumni, grant holders, future applicants - all united by their love for study and research abroad and all things German. What sparked your interest in Theater and Performance Studies, and especially German theater artists? My interest in German Theatre started with a book, Theatre for Children by Wolfgang Schneider, which I read when I was in college. When I started to do my Master’s in Theatre at Ankara University, I mentioned this book to my advisor Tülin Sağlam, who knew Professor Schneider. They were colleagues at the ASSITEJ (International Association of Theatre for Children and Young People). My advisor, Professor Sağlam, very much supported my interest in German Theatre, encouraged me to travel to Germany to see plays, and helped me meet with Professor Schneider. I met Professor Schneider in Frankfurt in 2011 when I was invited to the Starke Stücke, 17th International Children’s and Youth Theatre Festival. I found his ideas on theatre very inspiring and, since then, I have been exploring different German theatre artists, like Bertolt Brecht, Helene Weigel, Frank Castorf, and Thomas Ostermeier. Currently, I am working on my dissertation project that explores the theatre of second generation Turkish immigrant-artists at the Maksim Gorki Theatre. This summer, I had a two-month research stay in Berlin with the grant I received from the Tufts Graduate School as one of the winners in the 2018 Graduate Students Research Competition. At the end of September, I will attend the German Studies Association Conference in Pittsburgh, Pennsylvania, to present one of my essays entitled, “An Enemy or a Çapulcu? : Thomas Ostemeier’s Theatrical Reflection on Turkey’s Gezi Park Protests in the 19th Istanbul Theatre Festival,” in the session of Turkish-German Relations in Turkey and Germany. What was the most challenging experience you have ever had in pursuing research abroad? Field research plays a central role in my theatre scholarship, which requires me to travel to Berlin to go to theatres, conduct research in the archives, and interview with theatre scholars and artists to produce scholarship. Applying for research grants and waiting for the results has been the most challenging experience. What advice would you give to students who are thinking of choosing your field of study? Before being a scholar or practitioner of German theatre, they should be a spectator of theatres in Germany. What advice would you give to North American students and researchers who are thinking of pursuing research abroad in Germany? They should not hesitate to contact theatre professors and artists to ask for help for their research. They can be very responsive and helpful when they are available to meet in person. Which pictures, plants or unusual objects are there on your desk? When Frank Castorf was an attendant at Volkbühne Berlin, in the foyer, there were matchboxes with the picture of the sign of statue of Running Wheel in front of theater. I took one when I attended the theatre to see one of Castorf’s productions even though I do not smoke. Since then, I have kept it on my desk. Can you cook a German dish without a recipe? If so, which one? I cannot cook a German dish, but “Apfelstrudel” is my favorite. I also love drinking apple wine, but unfortunately it is sold only in Frankfurt. Who has inspired you the most in your career and why? Throughout my theatre education, I have had several theatre professors who are very passionate about theatre. Their love of theatre inspired me to pursue a career in theatre. Learn more about Hanife and our DAAD German Studies Research Grant. Do you know someone who should be featured in our ‘In Profile’-section? Or would you like to be featured yourself? Feel free to send us your suggestions to: newsletter@daad.org.